New Growth recently wrapped up evaluations on several Round 3 U.S. Department of Labor TAACCCT grants, as well as an impact evaluation of Skills for Chicagoland’s Future’s workforce programming. Those evaluations, together with our ongoing Round 4 TAACCCT evaluations, remind us how important it is to start the public data collection process as early as possible in a project. Navigating the disparate privacy laws and data sources across a dozen states, negotiating data security agreements, and facilitating data flow can take months and sometimes years. While it can be a daunting process, New Growth remains optimistic that many state agencies are improving access to employment and wage data as they acknowledge the value of program evaluation and research of public workforce programs. New Growth has partnered with a consortium of nine community colleges to develop a sustainability and impact strategy following the recent completion of a TAACCCT grant focused on the improvement and expansion of transportation distribution and logistics programming along the Mississippi River. Although it is challenging to manage multiple voices that are geographically distant, New Growth recognizes the ability of the consortium to take the next steps to utilize collective impact infrastructure and lay the groundwork for collaborative fundraising. By working together, the consortium has begun to provide a cohesive voice representing workforce development along the river. 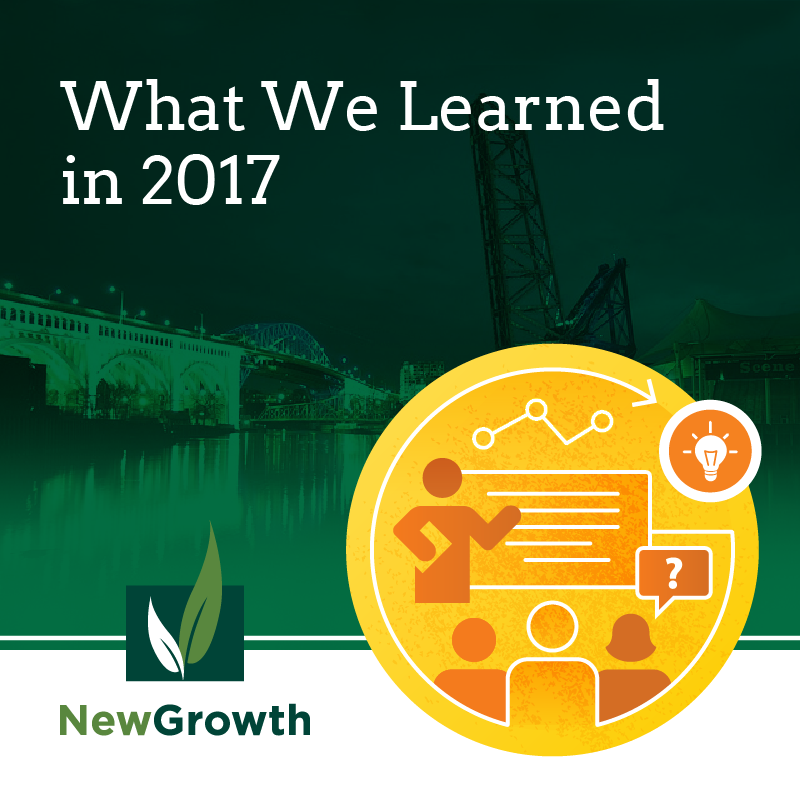 New Growth has been providing support to an initiative in Cuyahoga County, OH focused on improving wages and better aligning services for young adults. Within the young adult sphere of workforce development, there is a growing recognition that workforce development programs should couple positive youth development and demand driven focus in service delivery. Over the course of the year, the staff at the Young Adult Resource Center at OhioMeansJobs Cleveland/Cuyahoga County has developed different strategies to offer both through their programming. They have found that the integration is most effective when the elements of both are incorporated into training and case management (for example: offering information on in-demand occupations in job readiness training, or reflecting on the ways the staff is providing a supportive environment). In this way, these best-practices are contextualized and relevant for participants, rather than having them layered onto their experience. Through our best practice research on identifying the employers’ role in enhancing educational programs, we learned that meaningful employer engagement is key to strengthening the talent pipeline and closing skills gaps. A substantial relationship between the employers, educators, and other stakeholders is essential to program sustainability, strength, and impact. This means being an active participant in at least program design, program delivery (such as mentoring or speaking to a class), and hiring. Tracking program outcomes, such as enrollments, completions, and hiring, assists in proving successful strategies and continuous improvement. Apparently, the FedEx guy isn’t trying to steal all of our stuff. Quite the opposite, he brings us new stuff. Who knew?